Saudi dismisses Iraq's allegations that it backs terrorism as "ludicrous"
Saudi foreign minister Prince Saud al-Faisal says accusations by Iraq's Prime Minister Nouri al-Maliki that the Kingdom supports terrorism are "ludicrous". Speaking to reporters in Jeddah, Faisal said the Kingdom had criminalised terrorism, especially that perpetrated by the Islamic State in Iraq and the Levant (ISIL), and he advised Maliki to follow the policy pursued by the kingdom in eradicating terrorism. French Foreign Minister Laurent Fabius has said that Iraq needed a government of national unity, with or without Shia Prime Minister Nuri al-Maliki, to counter a Sunni rebel insurgency. Pressed in a media interview to say whether Maliki should form the broader-ranging government, which France advocated, Fabius replied: "With or withoutMaliki, but what Iraq needs is a government of national unity." Al Jazeera's Imran Khan in Baghdad says the Iraqi government may have restricted internet access in the country. 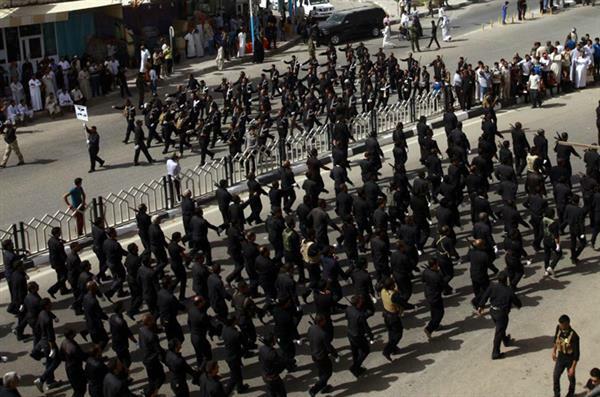 "The war on the internet continues here in Baghdad. Google, YouTube, Facebook, Twitter all seem to be out." Khan said. You can follow the latest updates from Imran Khan on Twitter @ajimran . Iraq's conflict is the result of sectarian divisions that have been allowed to fester, and it is up to Iraq's people and leaders to resolve those differences, US President Barack Obama said on Friday. In excerpts of longer interviews on several television networks, the president sought to place responsibility for holding off the threat posed by the ISIL, which has seized areas in the north of the country, and emphasised that US support would be limited and conditional. Obama suggested that failure to acknowledge minority concerns coupled with uncertainty in forming a government after elections in April had left Iraq vulnerable. "Some of the forces that have always possibly pulled Iraq apart are stronger now, (and) those forces that could keep the country united are weaker," he told NBC Nightly News. "It is ultimately going to be up to the Iraqi leadership to try to pull the politics of the country back together again." Local sources have told Al Jazeera's Imran Khan in Baghdad that Sunni rebels have captured Iraq's largest oil refinery. An unknown number of Iraqi soldiers are believed to have been taken prisoner after clashes at Baiji refinery, north of Tikrit. The mayor of a town northwest of Baghdad has said that it has fallen into the hands of ISIL fighters, the second to be captured by fighters in the mainly Sunni Anbar province. Mayor Hussein AIi al-Aujail said the local army and police force in Rawah pulled out when the fighters took control. 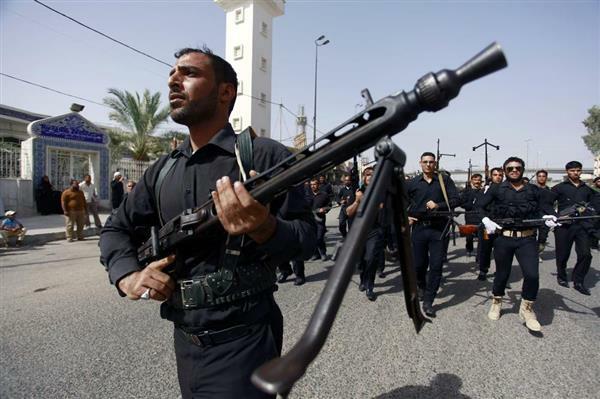 He said government offices in the town, along the Euphrates river 275 kilometres northwest of Baghdad, were being sacked by the fighters. The fall of Rawah, and the border town of Qaim on Friday, appears to be part of a new offensive. The Beiji refinery was reportedly taken over by ISIL rebels last night but the army denied those reports today. Al Jazeera's Omar al-Saleh reports that three staffers at the Beiji refinery told him that the refinery was under full control of rebel fighters. However, the government continues to refutes this information. Syrian jets have bombed rebel-held eastern areas close to the border with Iraq under the control of the Islamic State in Iraq and the Levant, killing and injuring dozens in stepped up raids against the group since its Iraqi offshoot made stunning gains in northern Iraq, Reuters news agency has reported. Read out story here. Sunni fighters led by Islamic State in Iraq and the Levant, the al-Qaeda breakaway group active in Syria and Iraq, have expanded their offensive in a volatile western province of Iraq, capturing three strategic towns and the first border crossing with Syria to fall on the Iraqi side. The towns of Qaim, Rawah and Anah are the first territory seized in predominantly Sunni Anbar province, located in the west of the capital Baghdad, since fighters overran the city of Fallujah and parts of the provincial capital of Ramadi earlier this year. The capture of Rawah on the Euphrates River and the nearby town of Anah appeared to be part of march towards a key dam in the city of Haditha that was built in 1986 and has a hydraulic power station that produces some 1,000 megawatts. Iraqi military officials said more than 2,000 troops were quickly dispatched to the site of the dam to protect it against a possible attack by the Sunni fighters, according to the AP news agency. Reporting from Baghdad: Imran Khan (@ajimran) and Omar Al Saleh (@AJEOmar). Reuters has reported that Iran's top leader has rejects the possible intervention in Iraq by the US or any other outside power, accusing Washington on Sunday of trying to manipulate Iraqi sectarian differences to retake control of the country it once occupied. In remarks published by the official IRNA news agency, Supreme Leader Ayatollah Ali Khamenei added that Iraqis themselves could end violence in their country, where Iran has steadily built up its own influence over the past decade. Iraqi military officials say Sunni fighters have captured two border crossings, one with Jordan and another with Syria, as they press on with their offensive in one of Iraq's most restive regions. The officials said the fighters captured the Turaibil crossing with Jordan and the al-Walid crossing with Syria on Sunday after government forces there pulled out. The officials spoke on condition of anonymity to the Associated Press because they were not authorised to speak to the media. 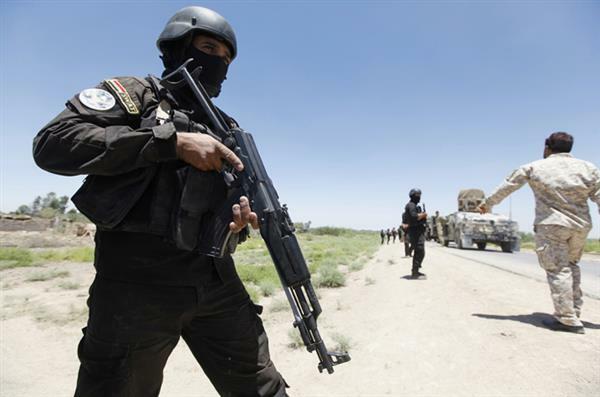 The fighters seized another town in Iraq's western Anbar province, the fourth to fall in two days, officials also said. Chief military spokesman, Qassim al-Moussawi, acknowledged the fall of the Anbar towns, saying government forces had made a tactical retreat and planned to retake them. He provided no further details. Paul Bremer was the senior US diplomat in the country at the beginning of the US occupation. He says the current crisis in Iraq is the fault of the current political leadership, and defends Washington's Bush era policies. Al Jazeera's Fergus Nicoll reports. 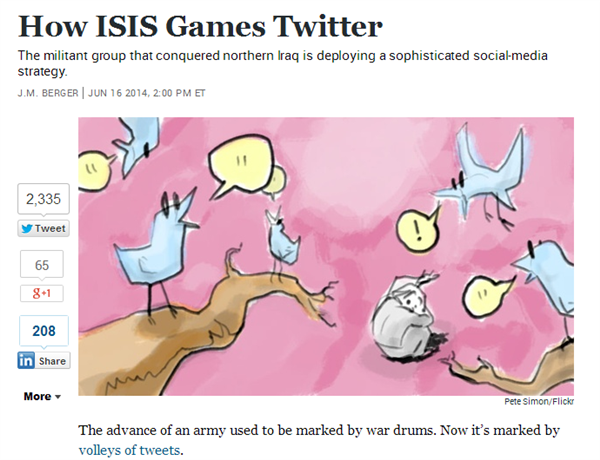 The Atlantic magazine has a fascinating look at how ISIL has used social media to push its message. Check out the article here goo.gl but please come back to us when you're done. We knew exactly what strategy they were going to use, we knew the military planners. It fell on deaf ears. @Salafi_Jihadi, a Twitter feed which is sympathetic to ISIL, states that four Nusra leaders in Syria have defected to ISIL and pledged their allegiance. Nusra and ISIL went to war last year after the leader of ISIL, Abu Bakr al-Baghdadi, ordered the leaders of Nusra in Syria to agree to a merger. The statement was issued yesterday. Al Jazeera cannot confirm the veracity of this report. The US secretary of state, John Kerry, has arrived in Baghdad. 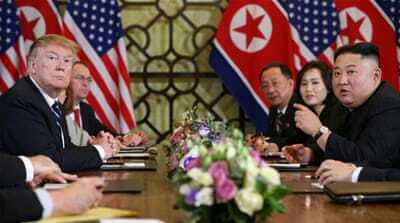 Kerry is scheduled to meet Iraq's Shia prime minister, Nouri al-Maliki, and top Sunni and Kurdish leaders. According to Jan Psaki, the state department's spokeswoman, Kerry would "discuss US actions under way to assist Iraq as it confronts this threat and urge Iraqi leaders to move forward as quickly as possible with its government formation process to forge a government that represents the interests of Iraqis". Al Jazeera's latest report on Iraq. Read it here. Imran Khan, our correspondent in Baghdad, has written an article on what Kerry's trip to Iraq reveals about the US position. More information from our Baghdad office. 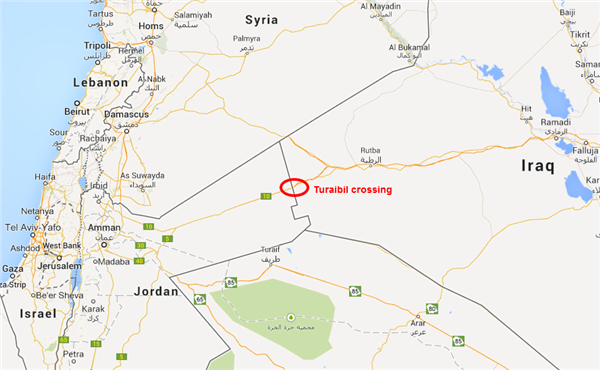 The border crossings of Turaibil (Iraq-Jordan) and al-Waleed (Iraq-Syria) in Anbar province are still under the control of armed groups. Rawa and Ana towns are also in the hands of rebels. 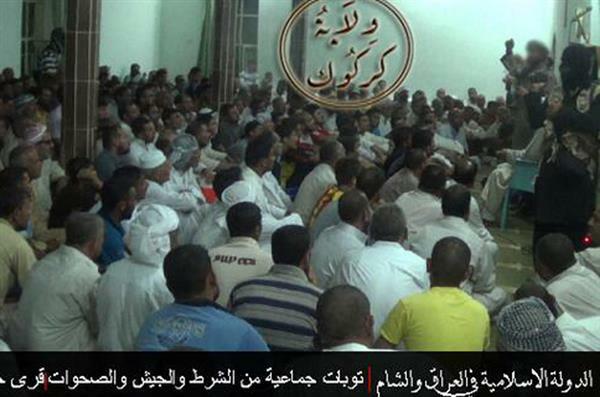 However tribal leaders in Haditha have stopped ISIL fighters from entering. The Iraqi army has sent reinforcements to the Haditha hydropwer dam, meanwhile. Here's a map of the Jordan-Iraq border. Turaibil a highway crossing between the two countries. ISIL members have posted videos to Youtube saying they would turn their attention to Jordan. Jordan as posted tanks and troops near border. 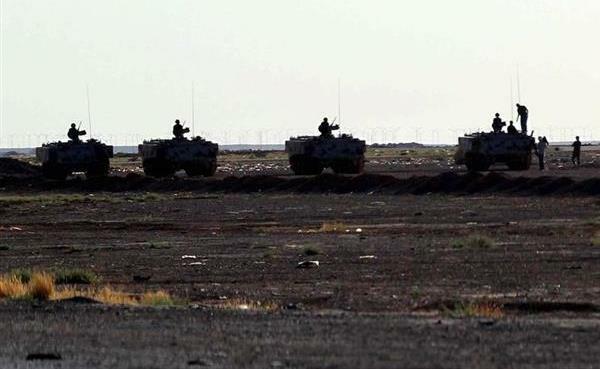 This EPA picture shows Jordanian troops and tanks posted near the Iraq border. The EPA states they are near the Ruwaished crossing. 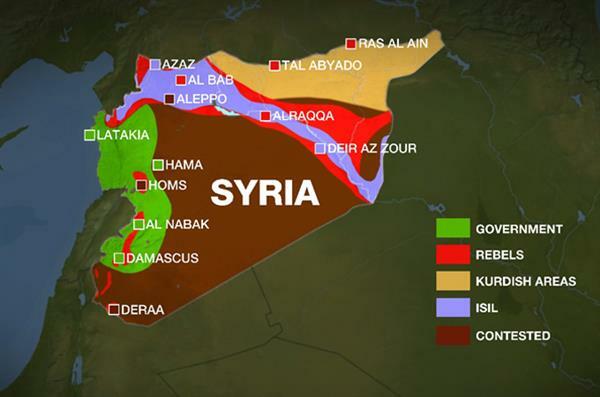 Al Jazeera's Inside Story recently looked at whether ISIL posed a threat to Iraq and Syria's neighbours. Back to Baiji. Salah Hashim, a legal adviser to the Iraqi League, a UK-based rights group, has told Al Jazeera that the loss of the refinery will hurt the government in Baghdad. All oil production from the refinery would be channeled north, meaning a huge loss of revenue for Baghdad. The AP news agency has suggested that the US is trying to wake up the "Awakening Councils" of Sunni militia in an attempt to defeat ISIL. 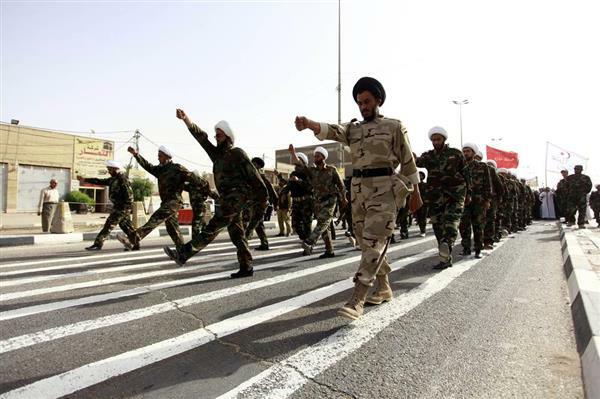 The news agency says the Obama administration is hoping to persuade Sunni armed groups known as Sahwa, or Awakening Councils, to fight against the Islamic State of Iraq and the Levant as they did against other al-Qaeda linked groups nearly 10 years ago. The Sahwa programme was a US-funded scheme against Sunni violence when it was at its height in the middle of the last decade. The agency says it is unknown how the US and its Middle East allies would urge Sunni tribes to resist ISIL without being funded, armed or assisted by US troops as they once were. It likely will require a new government in Baghdad to support the militiamen who have been sidelined by Shia prime minister, Nouri al-Maliki. 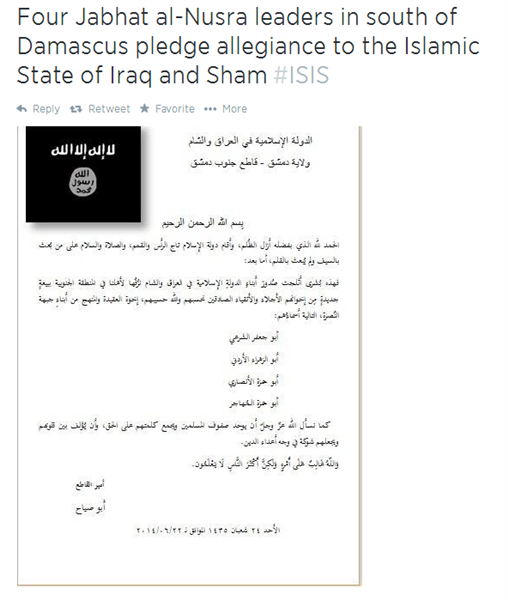 While the US hopes to reach out to members of the Sahwa, ISIL related accounts on Twitter are posting pictures claiming to be of Sahwa members pledging allegiance to rebels. This picture reportedly taken in Kirkuk shows former members of the army, police and Sahwa taking part in a repentance ceremony and pledging loyalty to ISIL. Jordan ready to defend itself from Iraq "aggression"
The Jordanian military has said it is ready to defend itself against "any aggression" from Iraq after Sunni rebels seized large swathes of territory in the country. "The Jordanian armed forces are capable of defending the kingdom from any aggression," border guard commander Brigadier Saber Mahayrah told reporters as they toured the border area. "We will not allow anyone to cross illegally," he said as armoured personnel carriers, Humvees and tanks deployed to the area. Mahayrah made his remarks two days after Jordan reinforced its border. "The Jordanian army has dispatched more troops, tanks, rocket launchers and armoured personnel carriers to the border with Iraq," a security official told the AFP news agency on Monday. "The army will not tolerate any kind of infiltration." The US has accused Syria of launching airstrikes into western Iraq in an attempt to slow an insurgency fighting both the Syrian and Iraqi governments. US Officials said the strikes appeared to be the work of Syrian President Bashar Assad's government, which is locked in a bloody civil war with opposition groups. 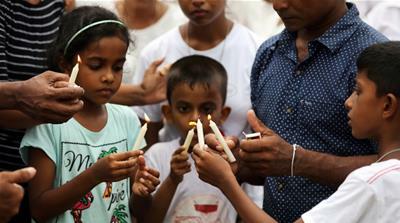 The target of the attacks was the Islamic State in Iraq and the Levant (ISIL), which has been fighting along with the rebels opposed to Assad and has since moved swiftly across the border into Iraq. The White House said intervention by Syria was not the way to stem the insurgents, who have taken control of several cities in northern and western Iraq. "The solution to the threat confronting Iraq is not the intervention of the Assad regime, which allowed ISIL to thrive in the first place," said Bernadette Meehan, a National Security Council spokeswoman. "The solution to Iraq's security challenge does not involve militias or the murderous Assad regime, but the strengthening of the Iraqi security forces to combat threats." The leading UN envoy in Iraq has said "Iraq can be saved" if political leaders reach across religious and sectarian lines to bring the country together, take military action against Sunni extremists who have captured large areas, and stick to the constitution. 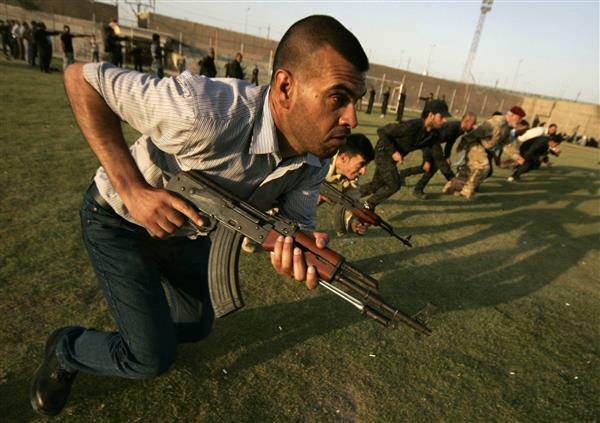 Nikolay Mladenov told UN reporters that the advance toward Baghdad b Sunni rebels "has stalled." But he warned that the conflict could easily become "a sectarian war." "The situation is grave, but Iraq can be saved and the country can be brought together," Mladenov said. "It demands a security operation but it also demands a political process." Prime minister says such a move would be "coup", in direct rebuttal of US efforts to tackle rising Sunni rebellion. According to the caption, this video shows the aftermath of an attack by Syrian jets in al-Qaim, Iraq. voiceover, off camera, says two rockets hit two separate areas in Rutba. Local estimates of casualties in Rutba and al-Qaim are 60 people killed, and double that figure injured. Reuters reports that three army helicopters have landed inside the university stadium of rebel-controlled Tikrit city, leading to fierce clashes with militants there. A source said fighting centred around the university compound. Tikrit in northern Iraq fell to Sunni rebels on June 12. We'll have more when it comes through. Iraq's Prime Minister Nouri al-Maliki has said the Syrian air force carried out air strikes targeting rebels on the Syrian side of the Iraq-Syria border. Maliki told the BBC he "welcomed" any such strike against rebel fighters, but noted Baghdad did not request the aerial raids which took place on Tuesday. The strikes came after Sunni rebels took control of the Al-Qaim border town on the Iraqi side of the frontier, providing them a strategic route into conflict-hit Syria, where an insurgency is also active. Israel has offered to help "moderate" Arab nations threatened by a lightning offensive by Sunni rebels in Iraq, as the country's top diplomat met with US Secretary of State John Kerry. Israeli Foreign Minister Avigdor Lieberman told Kerry at a meeting in Paris that "the extremists currently operating in Iraq will try to challenge the stability in the entire Gulf region, first of all in Kuwait," a statement from his office said. "Israel could provide effective and reliable assistance to moderate Arab states who are dealing with extremists," it added, without going into specific details. Lieberman said Israeli interests were converging with moderate Arab nations "with both sides dealing with the threat of Iran, world jihad and Al-Qaeda, as well as the spill-over of conflicts in Syria and in Iraq to neighbouring countries." "Today, there is a basis for the creation of a new diplomatic-political structure in the Middle East," his office said in the statement. Around two thousand Iraqi Christians have entered the Kurdish city of Erbil, fleeing fighting in and around the city of Mosul. An ISIL (Islamic State in Iraq and the Levant) artillery offensive against Christian villages in the north of the country on Wednesday sent thousands seeking sanctuary in the Kurdish enclave. Having fled their homes, they are now living in a sports centre in Ankawa, a Christian area in the capital. 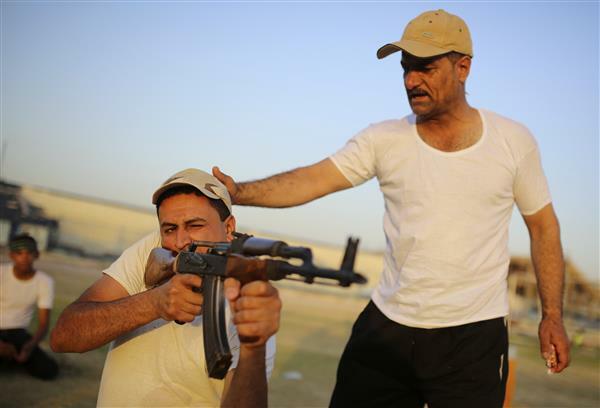 Many at the sports centre have told the Associated Press news agency they want to leave Iraq entirely. 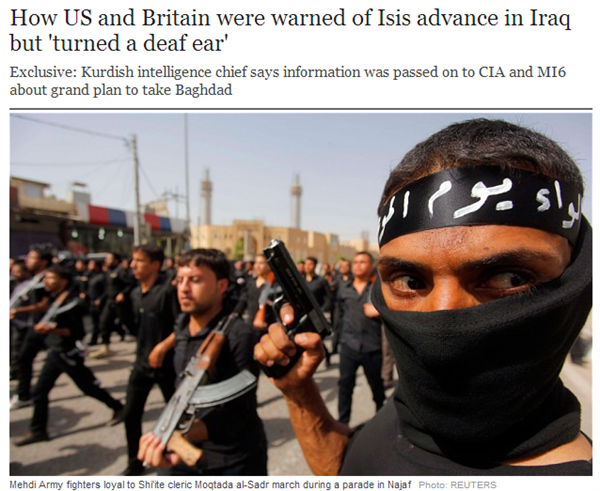 "We won't have a future here in Iraq, never. Now I want to emigrate to a European country. Now, at this moment," said Iman Abdul Aziz Majid. Saudi Arabia's King Abdullah has ordered "all necessary measures" to protect the kingdom against any potential "terrorist threats", an apparent reference to the crisis in neighbouring Iraq. State news agency SPA, said the monarch ordered the unspecified measures after he chaired a meeting of the country's national security council to discuss fallout from security developments in the region.